The Korean Cultural Service of NY is proud to present the first group exhibition of 2015 "Think It Over, Think It Slow." From June 10th to July 22nd, 2015, the Korean Cultural Service will be showing the group exhibition featuring the artists who were selected from the Call for Artists 2015: Sun Choi, Véronique Gambier, Daphne Jiyeon Jang, Dongjin Jeon, Andy H. Jung, and Minso Kim. The gathered artworks focus on the diverse phenomena that we easily pass by in the fast flow of modern day. As we walk by these various medium of artworks, the exhibition invites us to stand still and think about the things are missing in our every day lives and to contemplate about the self and our own connections to art. The opening reception and preview event will be open to public on Wednesday, June 10th from 6:00 P.M. to 8:00 PM. at Gallery Korea of Korean Cultural Service New York (460 Park Avenue 6th Floor, New York, NY 10022). 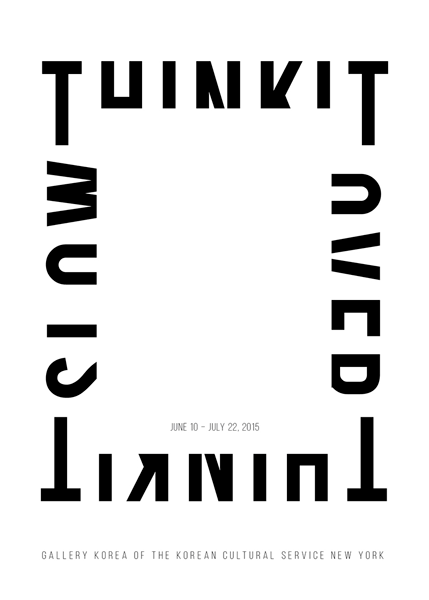 The exhibition will be on view from June 10th to July 22nd, 2015. Sun Choi received his B.A. in Fine Arts at Hong-Ik University; his recent artworks show his great interest on social issues and environmental problems. Specifically, he has used pig fat as painting material to represent the 2011 foot-and-mouth disease (FMC) in Korea. Choi also applied and created works of art by using invisible materials such as breath, body heat, wind, and smell. He has been creating art that finds meaning through its interactions with people. Born in the south of France, Véronique Gambier started to paint on large scale canvases at the age of 12 under the guidance of French Master Pierre Pallut, developing a strong sense of color and abstraction. She attended L’école des Beaux Arts de Toulon (College of Fine Art of Toulon) and L’école des Beaux Art de Luminy (Luminy College of Fine Art) in Marseille. She is currently working and living in New York. Gambier’s creative process is about exploring color, shape and texture for its distinct resonance to an emotion. She seeks to express tension on a canvas rather than harmony, movement rather than stillness. Daphne Ji Yeon Jang received her B.A. in Sculpture from Ga Chon University. Through her video works, Jang is bringing new meaning to classical sculptures. Jang's artworks show sculptures as moving images in 3D space. She uses the classical sculptures that can be found in the museums and adds movement to form a moving sculpture with a new story with contemporary backgrounds or materials. Through her moving sculpture video installations, Jang hopes to share feelings of courage, trust, sacrifice, love, and compassion. Dong Jin Jeon, who received his M.F.A. and B.F.A. in Fine Arts from Keimyoung University, uses the 'draw and repeat' motif in his artworks. Jeon repeatedly draws thin lines on a large canvas and creates a monochromatic image. According to the artist, the repetitive drawing method is intentional. He believes the painful repetitive actions are like a life of humans; after he completes the work and overcomes the movement of self-torture, it brings great catharsis. Andy H. Jung, who received his M.F.A. in Photography from Pratt Institute in New York, illustrates desires of humans in his photography. According to the artist, humans are animals of desire; humans desire new and artificial things, and even after they possess what they want, they constantly look for new objects. Jung's works connect tangible and man-made objects with his ethereal memories. Through his photography, the artist hopes to communicate with both artificial objects and the collective memories in a singular and unified image. Minso Kim received her M.F.A .in Art & Technology Studies from School of the Art Institute of Chicago, and her works of art depict the physical imprints of diverse human connectivity. According to the artist, her artwork functions at the center of poetics, translation, technologies, and delivering the raw feelings of text through manifesting the sounds of human languages. Kim is interested on the limitations of language. She believes that although humans use language to deliver their feeling, sensation, and thoughts to one other, it is difficult to perfectly understand one's messages via language. Inaugurated in 1979, the Korean Cultural Service New York (KCSNY) is a branch of the Ministry of Culture, Sports and Tourism (MCST) of the Republic of Korea. Under the authority of the Consulate General of the Republic of Korea in New York, KCSNY works to promote cultural arts exchange and stimulate interest in Korean culture through various opportunities. KCSNY provides diverse activities including exhibitions, concerts, film festivals, and educational programs. KCSNY is located at 460 Park Avenue (at 57th Street), 6th Floor, New York City. www.koreanculture.org. Please visit www.koreanculture.org for more information.